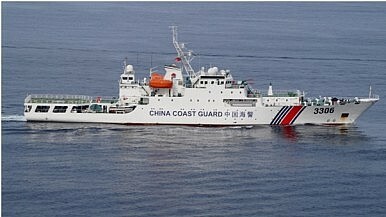 For the first time, China sent an armed vessel into disputed waters near the Senkaku/Diaoyu Islands. For the first time, China has sent an armed Coast Guard vessel near disputed islands in the East China Sea, according to Japan’s Coast Guard. Reuters reports that the Chinese ship, which appeared to be equipped with four gun turrets, sailed within 30 kilometers (18 miles) of part of the Senkaku/Diaoyu island group, which are claimed by both Japan and China. “We have delivered our strong protest and requested (the Chinese coastguard) to stop the activities near the Senkaku Islands immediately,” a spokesperson for Japan’s Ministry of Foreign Affairs told Reuters. The incident is a reminder that, while the South China Sea disputes have taken over the headlines, tensions in the East China Sea remain. 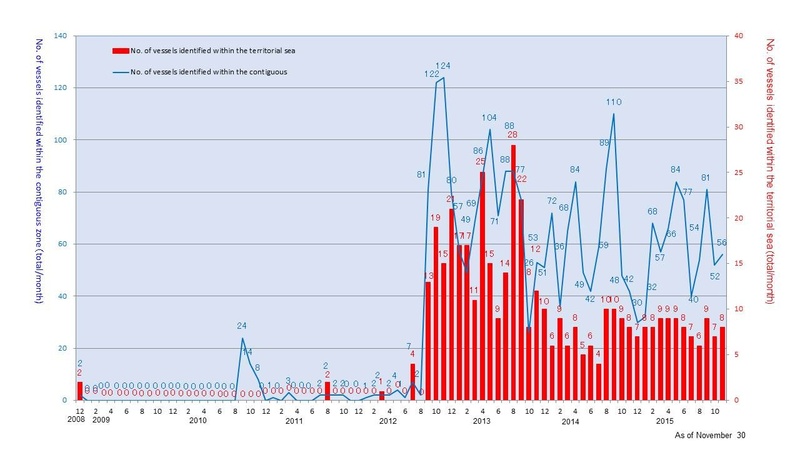 Things have calmed down significantly since 2012, when China was sending an average of 19 vessels in the territorial waters around the Senkaku Islands every month. However, prior to 2012, there had only been a total of seven Chinese vessels identified in the territorial seas around the Senkakus – and none before 2011. In September 2012 (when the regular Chinese patrols began), Japan’s central government nationalized three of the Senkaku Islands, which had previously been under private ownership. Beijing accused Japan of breaking a tacit agreement to shelve the territorial dispute and began sending Coast Guard vessels (or Marine Surveillance vessels, prior to 2013 when the Coast Guard was formed). Japan’s foreign ministry dismisses this explanation as a “pretext.” To analysts in Tokyo, the flare-up in East China Sea tensions began earlier, with a 2010 incident where a Chinese fishing boat rammed a Japanese Coast Guard vessel near the disputed islands. Thanks to a slow thaw in China-Japan relations, beginning with a meeting between President Xi Jinping and Prime Minister Shinzo Abe at the APEC summit in Beijing in November 2014, the Senkaku/Diaoyu dispute has mostly disappeared from headlines. But Tokyo remains quite concerned about Chinese activity near the disputed islands, which are currently administered by Japan. When relations were at their nadir in 2012 and 2013, some security analysts in Japan thought Beijing might actually try to take control of the islands by force. Even now, Tokyo likes to occasionally remind the world of the tense situation in the East China Sea. Japan continues to formally protest each incursion by Chinese vessels near the disputed islands. Last July, Japan’s Ministry of Defense and Ministry of Foreign Affairs released details on Chinese offshore gas platforms in the East China Sea, where there is no agreed-upon maritime demarcation between Japan and China. The Japan Air Self Defense Force scrambled its jets 117 times against Chinese planes in the third quarter of 2015.